While I'll do whatever I can to help out my husband, when he called home from work the other day asking me to bring him his phone charger, I couldn't help but roll my eyes. Of course he needed the charger, he was on his way to the airport that afternoon for a business trip and, let's face it, traveling when your phone has a dead battery is the pits. Being the nice wife that I am, I did bring him his charger... along with a stern reminder that there was no reason for his phone to ever run out of juice thanks to the Chargepak NT600C External Battery Pack from New Trent. 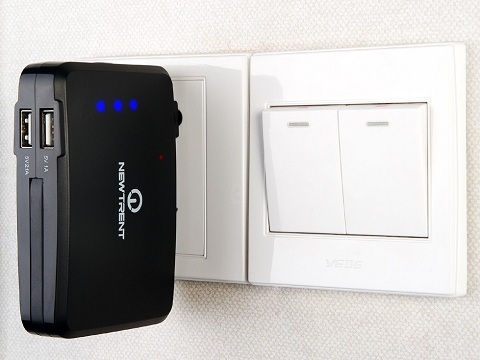 Compatible with a HUGE list of cell phones, tablets, portable game consoles, mp3 players, GPS, cameras and more, the New Trent Chargepak makes it possible to charge not one, but three, of your devices in an extremely short amount of time just about anywhere. In the car, on an airplane, on a walk, in a meeting, during a power outage, in an emergency... this external battery allows you to use nearly all of your devices whenever and wherever you need them. As I pulled the Chargepak out of the box, right away I appreciated the sleek, minimalistic look and the fact that it didn't come with one item in particular: a separate charger. Instead of having to tote around a separate cord and plug to charge up the Chargepak, this external battery has a built-in AC charger. 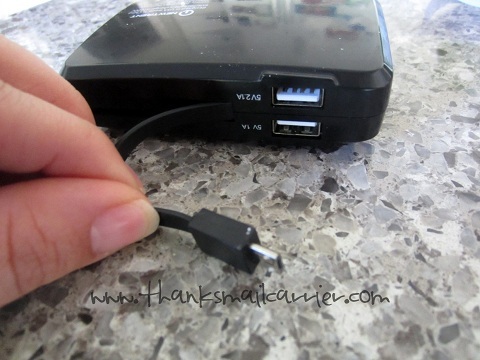 Not only does that make it extremely convenient to take it on the go, but it is also possible to use this while it is plugged into the wall (like a splitter). Along with ensuring that users don't have to keep track of a separate power cord, New Trent designed the Chargepak with its own built-in micro-USB charge cable. Whether your main gadget uses this cord or you simply have it as an "extra," this feature is great to charge a third device along with the two USB ports! ...and then you're set to go. While you're traveling or away from an outlet, simply plug your devices' power cords right into the USB ports (or use the provided micro-USB cord), and the Chargepak starts powering them up. In a controlled test of how much power the Chargepak provides, testers found that an iPhone 5 battery on its own would last for seven hours while using the Wi-Fi... but with the Chargepak, the battery lasted around 22 hours instead! 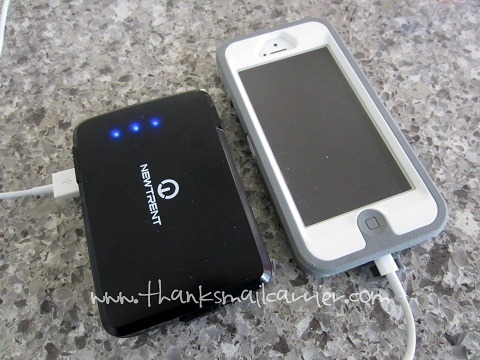 Instead of ever fretting that you can't make a call while you are out or that you won't be able to listen to music or watch a movie on your iPod while traveling, having the New Trent Chargepak handy makes much more sense. 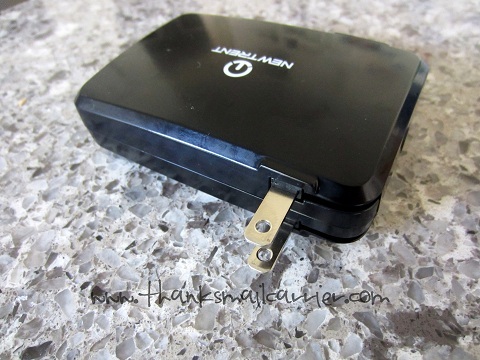 It is small, lightweight and perfectly portable to be stashed in a briefcase, backpack, tote bag, suitcase or more so that you are prepared to charge your devices on the go with ease. The Chargepak NT600C typically retails for $44.95 but can be purchased right now directly from Amazon for only $39.95 so that you (or your recipient of this great gift) will never be at a loss for power again. Also be sure to check out the "Special Offers and Product Promotions" section for the most up to date discounts and deals from New Trent! 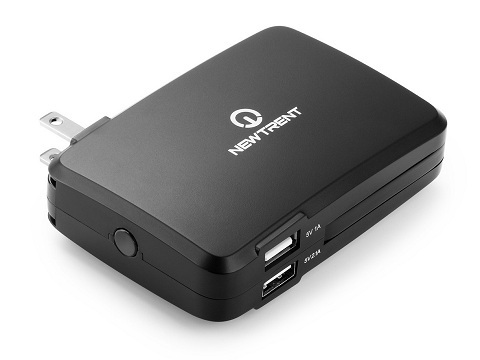 New Trent Chargepak NT600C External Battery! 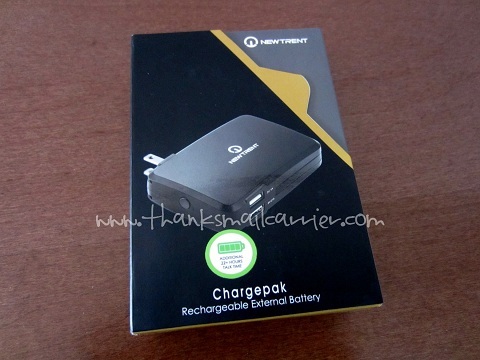 A big thank you to New Trent for providing a Chargepak for me to review as well as for one lucky giveaway winner. The opinions shared are my own and honest and if you really need to see more, click here to see how I roll. I like the fact that, along with the two USB ports, you have the built-in mini-USB cable. I like that this device charges and then is able to charge any other devices (phones) on the go. Nothing like being stuck without power somewhere (aka in the park or traveling) and not have a charged phone. I like that it allows for 26 hours of charge. I like that you can charge two phones at once. My 25-year-old daughter sells her art at anime conventions and we are often away for weekends and many times the hotels have limited open plugs and we have to take turns charging our phones. This way we could do both at once! I love the fact that you can charge 3 devices at the same time. My kids always grab my car charger before I can even get close! I like that you can charge a tablet and 2 phones at the same time. I like that you can charge 3 devices at once. I like the built in AC charger. I would love to have one of these. I like the reliable lithium ion battery and convenience of it. My favorite feature is the Dual USB charge ports plus third built-in micro-USB charge cable that allows you to charge 3 devices at once. I like that it can charge more up to 3 devices at once, and that it has enough battery for up to 26 hours of video for an iPhone. I like that it has 500 times recharge cycles battery life. It has an extensive line of phones it can charge. I like that you can charge 3 products at once. That and the portability makes it a great product for travel. Charging multiple devices! We all need that! I'm glad to hear it can support both my & my husband's phone, and his tablet too. I love the fact I can charge all our phones and ipad on the same charger, less to keep up with. To be able to enjoy 26 hours movie time is a plus which means its a really good product. I like that the NT600C Chargepak is compatible with original Apple iPhone & iPad charge cable & wall charger. I like that you can Enjoy 26 hours movie time for iPhone 5 4S 4 3G 3Gs and iPod touch (1G to 5G), 70% battery life for iPad 2, 40% battery life for the New iPad (3rd gen.) Thanks so much for the fantastic giveaway! Dual USB charge ports with the addition of a third built-in micro-USB charge cable for additional simultaneous charges! I like that it's compatible with Major Smartphones. I like the Dual USB charge ports. I like the fact that you can charge more than one item at a time and that it works with so many devices. I like the 26 hours of charge. 26 hours of movie time on my iphone!! That could keep my kids going in an emergency! I like the portability of it and also the 26 hours of movie time. I love that I could take this traveling. I like the dual USB ports. I just like the convenience of basically having a portable wall outlet to charge all mobile devices. I like that it combines USB charging with phone charging (and is compatible with mine!). That means less chargers to carry when we travel. I like how small and compact it is, great for traveling. I like the built-in micro-USB charging cable. My favorite feature is the 26 hours of movie time for iPhones. I like that it has 2 connections and its small! I like the Dual USB charge ports with the addition of a third built-in micro-USB charge cable for additional simultaneous charges feature! I like that it weighs only 5.6 oz. I just love how easy it would be to pack and access on trips!! I like that you can charge three things at a time. I also like that it is so nice and compact. I like that it charges 3 devices at once. I like its sleek and minimalistic design. I like the feature of charging a tablet and up to two smart phones. I like that it can charge the iPad mini that I'm getting next month. I like that it works with ipad mini because I just got one a few months ago! I like that it weighs only 5.6 ounces! I like that it's Compatible with most Smartphone's, 5V Tablets and other compatible devices. i like that it's lightweight and really good for anything. My favorite feature is that it's compact. Thanks for the chance! I love that it is compatible with multiple types of smartphones and devices! Makes it easy for the whole family to use if we need to! I love that I can charge multiple devices at once. I would be the tailgate MVP this fall! My favorite feature is the ability to charge multiple different devices. I like that I can use it for my iPad mini. I like that it is compatible with so many brands. It's compatible with all the phones we have in the family. I like that it can charge multiple items and there is no cord. I love the compatibility with so many electronics! I like the fact that it has a wall plug built-in! I can use it anywhere, especially when I'm travelling! I like the built-in mini-USB cable. what's not to like about this! I cant tell you how many times we have forgot a charger or that we ended up staying over someplace longer than expected without a backup charger or that person not having a compatible charger. This is awesome cause not only could I save my own phone but my ipod and maybe even someone else's phone too! This would be a perfect gift for people to leave in the car or at work. I like that you can charge multiple items at once. I love that you can charge two things at the same time and my most favorite feature is Ultra-reliable Lithium-ion battery with 6000mAh of power and a charge last for 26 hours. Compatible with most Smartphone's (Apple, Samsung, HTC, Motorola, LG, Nokia, Blackberry, Sony, etc...), 5V Tablets and other compatible devices. I can charge 3 items rapidly! I love that it can charge three things at once! Glad it would charge my husband's Blackberry when he's on the road! It would be nice if my phone stopped dying half way through the day. This will charge three phones at the same time. That it is compatible with most Smartphone's, 5V Tablets and other compatible devices. 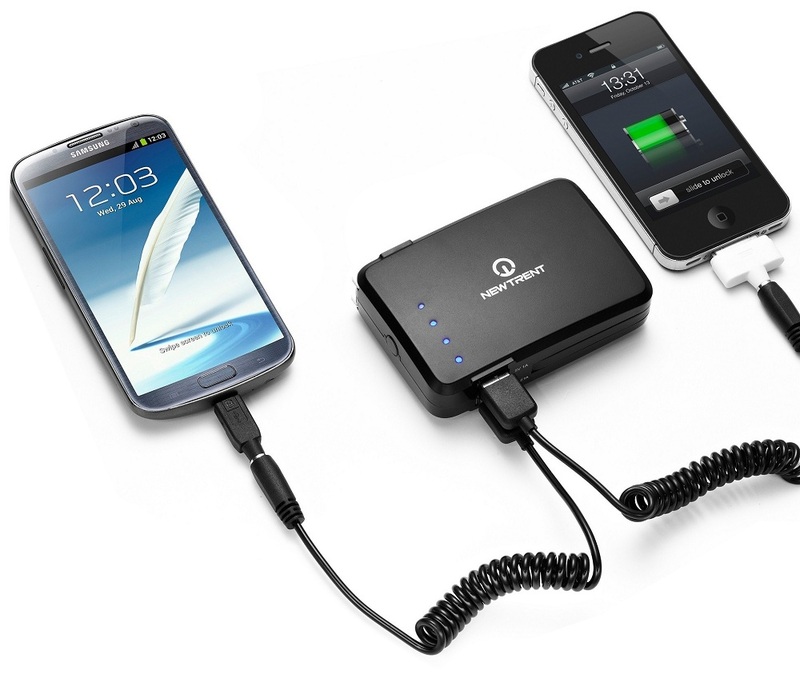 5V@2A-1A Triple USB Charger charges 3 DEVICES rapidly. 2A output is for iPad/Tablet and 1A output is for iPhone/Smart phones (1 tablet & 2 Smartphones). Right now it's like every outlet in the house is charging something different and it is driving me nuts! I like that it is light and hubby would be happy if we won. I like that I can still charge my device while the charger is charging. My favorite feature is the Triple USB Charger which charges 3 devices rapidly. I like the fact that it is compatible with so many different devices. I like that we can change up to 3 things at once! I like that it plugs into the wall. Some of the ones that require USB are very touchy as to where you plug them in. I like that it is compatible with the most popular smartphones and tablets. I like the fact that I can charge multiple devices, but most importantly it can charge the phone I own! I like that its small and compact for traveling. .... compatibility.... but I also LOVE the PRICE!!!! My favorite features are the triple output ports. I love that it has the wall plug built in - I currently have a charger that can only charge by being plugged into a computer! My favorite feature is you can charge 3 devices at the same time and is compatible with many devices. Christina - xristya@rock.com - I love the dual charge ports! I like that it can rapidly charge 3 devices at once. I like that it can charge up to 3 devices at one time! I like the capability to charge three items at one time. I love that you the charger is rechargeable instead of battery operated. I like that it works with my Android and Apple devices. I like that you can charge up to 3 devices and that they sometimes last longer with this battery charge than if you used another type of charger. I like that it is compatible with every device I use. I like that it is so small and portable. I love the triple output ports - it can charge so many things at once! I like the fact that "Ultra reliable Lithium-Ion battery with 6000mAh with 500 times recharge cycles battery life"
I found that I like besides it small size it is fast and and charge 3 devices. with it's Lithium-Ion battery. 5V@2A-1A Triple USB Charger charges 3 devices rapidly. I love that it is a Triple USB Charger. Very handy! I like that I wouldn't be stuck with a dead battery anymore! My phone is my lifeline. I use it for GPS. I've been stuck in some pretty shady places with a dead phone! I like the ability to charge 3 devises at once! I love that I could charge my iPad and phone at the same time!! I love that it works with Apple!!! I like the twenty six hour charge capability! I like that it's compatible with my phone, an HTC One X.
I love that it is compact so it is easy to carry around with you. I like that it has 26 hours of charge! The feature that I like the most is the triple output ports.